1. the greenhouse effect: heating air by solar radiation under a glass or polymer canopy (the collector). 2. the chimney effect: creating an updraft in a tower or chimney located at the center of the canopy. 3. wind turbines: converting a moving air mass into electrical energy. A few experimental solar updraft towers have been in operation in Spain, Turkey, and other countries. Several new ones are planned in Australia and Arizona . An air mass flow has a temperature increase when heated with solar radiation according to the formula , where is the soil absorption factor, is the glass transmittance factor, is the density of air, and is the specific heat of air . The air mass flow as the result of a temperature difference in a stack of height and cross section can be calculated by , where is the discharge coefficient for the opening (assumed to be 0.65) . Solving the above two equations simultaneously gives the temperature between the end of the collector and the entrance of the stack where the turbine is located. The resulting power of the turbine can be calculated with the formula . 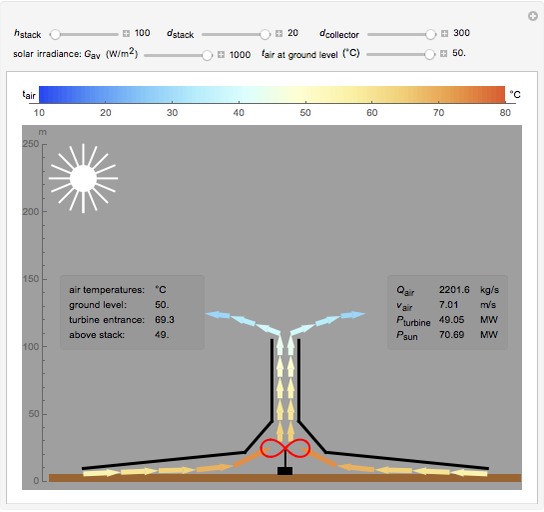 For comparison, the solar radiation energy on the same surface area as the canopy roof is . 4. : the solar radiation energy on a surface equal to the collector roof surface. The theoretical background of a solar updraft tower is discussed in . Most of the formulas used here come from this article. Other interesting descriptions are found in . For a theoretical background of the stack effect see . A working solar tower in Spain is discussed in . For solar tower projects around the world see . C. D. Papageorgiou. "Efficiency of Solar Air Turbine Power Stations with Floating Solar Chimneys." Floating Solar Chimney Technology. (Aug 19, 2011). https://www.actapress.com/Abstract.aspx?paperId=18316. J. Schlaich, R. Bergermann, W. Schiel, and G. Weinrebe. "Design of Commercial Solar Updraft Tower Systems." 1000 Friends of Florida. www .1000friendsofflorida.org. "Air Movement and Natural Ventilation." The University of Hong Kong, Faculty of Architecture. (Apr 29, 2003). http://arch.hku.hk/teaching/lectures/airvent/. E. Lorenzo. "Las chimeneas solares." Censolar. www.fotovoltaica.com/chimenea.pdf. "Clean Green Renewable Energy." EnviroMission. www.enviromission.com.au/EVM/content/home.html. Erik Mahieu "Solar Updraft Tower"